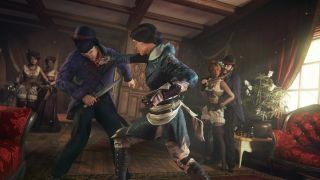 The new Assassin's Creed Syndicate: Jack the Ripper DLC trailer doesn't really tell us anything that we didn't learn from last week's story trailer: Jack has better moves than rank-and-file Assassin flunkies, and a serious mad on for Evie Frye. But it's cool stuff nonetheless, because it's a "VR trailer," with full support for 360-degree viewing through the Samsung Gear. The 360-degree view works on conventional PCs as well by clicking and dragging the YouTube screen. It's probably not as immersive as the VR experience, although I don't have a Gear headset so I can't say so unequivocally, but it works quite well either way. You can even drag around the intro text and Ubisoft logo, although you'll end up staring at a black screen if you do. It's possible that there are secrets hidden here and there in the trailer, in corners or down halls that aren't seen by default, that hint at what's coming in the DLC. I watched it a few times and didn't pick up on anything obvious, but I'm not super-tuned-in to Assassin's Creed and so subtler notes may well have escaped my notice. For now, I'm sticking with my theory that Jack is Jacob and this is all just a sibling squabble that's got a bit out of hand. We'll find out the truth on, or shortly after, December 22, when J-Rip makes his way to the PC. If you can't wait that long to learn the truth, you can probably pick up some spoilers from the console version of the DLC, which is out today.